Air conditioning is the process of altering the properties of air (primarily temperature and humidity) to more favourable conditions. More generally, air conditioning can refer to any form of technological cooling, heating, ventilation, humidity control or disinfection that modifies the condition of air. 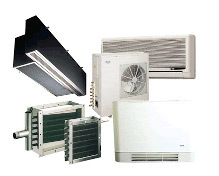 At Alan Williams & Co our engineers can advise on all aspects of the selection, specification and application of a wide range of air conditioning equipment. Our independence and partnerships with many of the world’s leading manufacturers allow us to provide you with most suitable and cost effective solutions.